When you feel emotionally numb, what can you do? Is there anything that can make you feel better? There are many feelings that can make us human beings uncomfortable. Anger, sadness, hurt, anxiety, fear, loss or grief, for example. Most of us would not choose to feel any of these. In fact, we will often go to great lengths to escape and avoid feeling them. But there is one feeling that can be more intolerable than any of those. It’s in its own category because it is not like the others. I have seen this feeling drive people to do extreme things to escape it, like take risks, harm themselves, put themselves in dangerous situations, or even consider suicide. Many people feel this feeling, but few have words to describe it. I call this feeling the “unfeeling feeling.” The best way to describe it is a deep sense of emptiness or emotional numbness. Here are some important facts to know about emotional numbness. You have the unfeeling feeling for a reason, and you are not alone. Other people feel this way too. But everyone does not feel this way. The emotional numbness you feel is a message from your body. Your body is trying to tell you something, and it is vital that you listen. This message from your body is one of the most valuable and important ones you will ever receive. The message is this: Your feelings are blocked off. 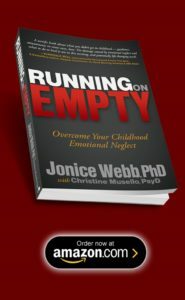 The likely cause of your blocked-off feelings, and hence your emotional numbness, is Childhood Emotional Neglect. 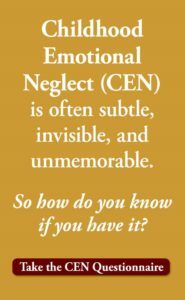 Childhood Emotional Neglect (CEN) happens when your parents fail to notice, respond to, and validate your emotions enough as they raise you. When you grow up with your feelings ignored or unwelcome, your young brain builds a wall to block them off. It’s an effective coping mechanism that helps you avoid being a “problem” in your childhood home. But this effective coping mechanism backfires when you grow up. As you move into adulthood, you need your emotions. If you were a boat, your emotions would be your engine, anchor, and rudder. They should be not only grounding and rooting you but also motivating, directing and guiding you. When your emotions are blocked off, your body feels it. Something vital is missing. You sense this deeply, and it does not feel good. Just as your body knows when you are hungry or thirsty, it also knows when your feelings are blocked. You are emotionally numb. And now for the good news. If you feel emotionally numb, there is plenty of hope for you. I am going to give you answers. There are two ways to address your emotional numbness. One is short-term coping, and the other is long-term solving. To truly address the problem it makes sense to do both. But in this article, we are going to talk about short-term coping. How do you manage the unfeeling feeling when you get it? Trying to avoid or escape the unfeeling feeling will not work. It’s natural, when you feel numb, to try to escape it by using external or physical stimulation. That’s why so many people might go shopping, sky-dive, drink, use drugs, gamble or even harm themselves. When you’re feeling this, it seems like something extreme will solve it by making you feel something…anything seems better than nothing at that moment. But when you take any action like this to escape numbness, you are only setting yourself up for more numbness in the future. Plus the numbness can drive you too far, so you are at risk for overspending, over-drinking, or excessive risk that might harm you. There are, however, a few far healthier and more effective things you can do. First, it’s very important to take note that you are feeling emotionally numb or empty. Second, you must do the opposite of escape or avoidance. The key to dealing with numbness in the moment is to go straight at it. In other words, the best way to cope with numbness is to try to reach your blocked-off emotions. To do this, you must focus inward, not outward. You must reach out to your emotions. Remember and reimagine a time when you felt a strong emotion: To do this, close your eyes. Think about a time in your life when you felt strong hurt, happiness, sadness, pain, loss or joy. Put yourself back there and try to relive it in your mind. As soon as you contact a feeling, allow yourself to feel it. Think about what you are feeling, and about why this was such an intense experience for you. Once you do this, you will find that your numbness has left you. Do The Identifying & Naming Exercise: I specially created this exercise to help you get in touch with your blocked-off feelings. To do it close your eyes, clear your mind, and focus your attention. 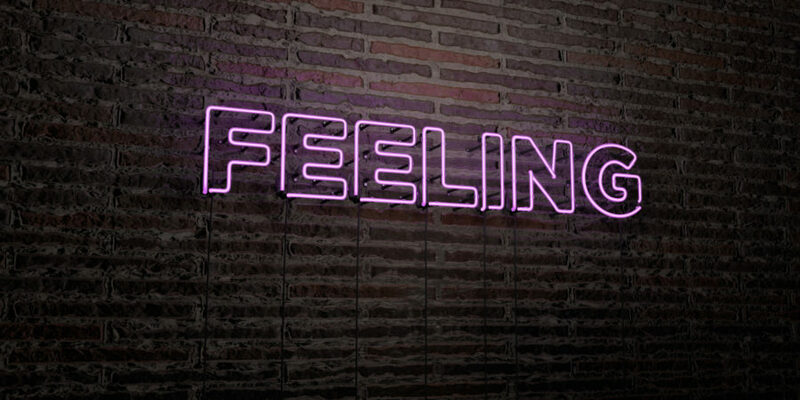 Then ask yourself, “What am I feeling right now?” Try as hard as you can to identify a feeling in your body. Any feeling at all. If you feel nothing, keep trying. If you become frustrated, congratulations. You are having a feeling. As soon as you have a feeling, your numbness will be replaced. (To learn more about how to do the Identifying & Naming Exercise, including additional helpful steps, see the book Running On Empty. Meditate: This is a way to not only focus inward but also to take control of your own mind. Meditation is the surest way to go straight at your numbness instead of escaping it. It may seem impossible, but just trying to do it is a way of proactively challenging your numbness. Reach out to someone you like or love: The feeling of numbness thrives on disconnection. You cannot feel numb when you are feeling connected to another person. Connecting, talking or laughing with someone is an excellent way to extinguish your emotional numbness. When you feel emotionally numb, choose an option above and do it to feel more alive. But overall, the best way to not only manage but extinguish, emotional numbness from your life is to heal the Childhood Emotional Neglect you’ve been living with all these years. 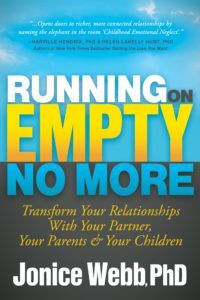 To find out how to remove Emotional Neglect from your relationships, and banish numbness from your life by replacing it with connections to others, see the book Running On Empty No More: Transform Your Relationships. Sometime’s I kind of forget things, or don’t understand things. I have read your both books, skipped the chapters on parenting as I have never been one, but can I ask for a reminder about long-term treatments? Dear Husayn, for help with CEN you can contact a therapist from the Find A CEN Therapist List on this website or you can consider taking my online CEN Recovery Program, Fuel Up For Life. Thanks for describing and explaining so well.It’s all new and relieving of some tension and pain. This observation about emotional numbness is perfectly described. Thank you for publicly sharing this information. You’re so welcome R. I’m glad to be of help to you. I have long believed that my emotional numbness was a desired state of being. I have been in therapy and my goal was to feel the positive emotions and continue to be numb to the “negative” ones. One therapist commented that when I was upset I would “burst into tear”, as only one tear would fall. I read with iñterest your posts. I can relate to so much. Dear Tillie, your “negative” emotions are just as valuable as your positive ones. I’m glad you are realizing that. Now you can practice listening to their messages. Dr. Jonice thank you so much for all your insights and methods of coping. Question: does emotional numbness come up in stages? Meaning that once a certain hoop is achieved , could there be more behind it that needs to be worked on? Hi Rose, yes definitely. Almost all emotional healing happens in stages, or layers. Take care!